Today’s photograph is sort of ironic in the sense that you can see tracks running along Woodward that will soon be restored once the new light rail system is completed from Hart Plaza to New Center. In a city dominated by the automobile for so many years it’s incredible to finally see other modes of transportation springing back to life. Detroit, July 1942. “Looking north on Woodward Avenue from the Maccabees Building with the Fisher Building at the distant left, and the Wardell Hotel at the right.” 4×5 Kodachrome transparency by Arthur Siegel. 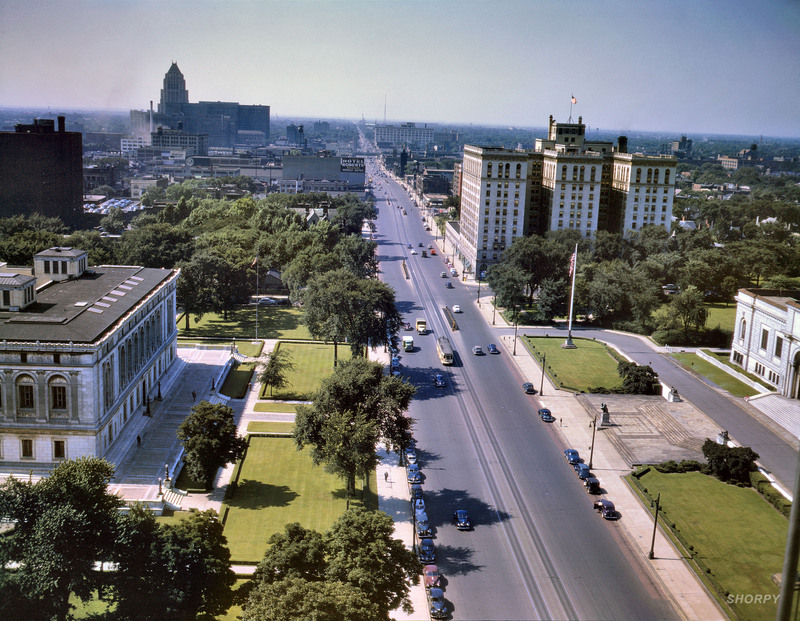 This entry was posted in Detroit, Shorpy Saturday and tagged 1942, automobile, detroit, fisher building, green, hart plaza, july, light rail system, maccabees building, new center, photos, transportation, wardell hotel, woodward. Bookmark the permalink.